Download four bonus tracks from this title for FREE on ReverbNation just by signing up for our email list. In return, you will be lightly pestered with our aperiodical email newsletter, The Passing Parade, which is published a few times per year. (Los Angeles, 7 June 2006) Master keyboardist and prolific composer Erik Norlander is proud to announce the release of his first DVD documenting his landmark concert in St. Petersburg, Russia. 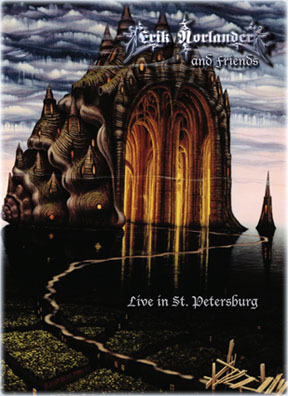 "Erik Norlander and Friends - Live in St. Petersburg" contains 90 minutes of concert material from this spectacular event plus the 45-minute documentary, "The Road to Russia", which tells the story of Erik's three month tour across the USA and Europe leading up to the final concert in St. Petersburg. The documentary contains interviews with Erik and all of the contributing musicians along with additional concert performances from American and European shows. "Erik Norlander and Friends - Live in St. Petersburg" also contains a bonus audio CD with the best tracks from the concert along with two studio tracks including a soaring cover of "From Russia With Love" featuring the iconic vocals of Norlander's wife, Lana Lane. "Erik Norlander and Friends - Live in St. Petersburg" features the vocals of Lana Lane along with the now familiar voice of Kelly Keeling who appeared previously on Norlander's "Music Machine" (2003) and "Stars Rain Down" (2004) CDs. Keeling also plays bass in the concert ably switching between fretless and fretted basses throughout the show. Joining Norlander, Lana and Keeling on stage are the Dutch musicians Peer Verschuren on guitar and Ernst Van Ee on drums who have been touring together with Norlander and Lane for several years from Europe to Japan. Verschuren and Van Ee have been previously featured on Norlander's "Stars Rain Down" album and also appear on the recent Lana Lane titles, "Lady Macbeth" and "10th Anniversary Concert" (both 2005). Like Kelly Keeling, Peer Verschuren was also a prominent contributor to Norlander's 2003 rock opera, "Music Machine", so it is no surprise that many tracks from this masterwork have found their way into the St. Petersburg concert. The stomping rocker "Beware the Vampires", the anthemic ballad "Fallen", the sprawling space jam "Sky Full of Stars" and the unforgettably melodic "One of the Machines" are standout pieces on the DVD. "Erik Norlander and Friends - Live in St. Petersburg" also showcases Norlander's uncanny ability for re-interpreting cover songs by his favorite artists. Norlander's version of the Procol Harum classic, "A Salty Dog" moved audiences around the world with the soulful voice of Kelly Keeling delivering the lyrics with power and substance. "A Salty Dog" was brought into the set to follow Norlander's Rocket Scientists standard, "Mariner", which Keeling also takes to new heights with his soaring vocals and fluid fretless bass. Another classic cover featured on the DVD is Norlander's arrangement of "In the Court of the Crimson King" sung with grace and style by Lana Lane as she has done in concert since her "Queen of the Ocean" tour in 1999. In addition to the bow to original prog rockers King Crimson, Norlander also puts in nods to Vivaldi and Grieg as part of the piece. For this DVD, "In the Court of the Crimson King" is taken from the Cal Prog 2004 festival in Whittier, California where Norlander and friends helped to launch the inaugural version of this now established event in the progressive rock community. The final cover song on the DVD is a new studio recording of the James Bond theme, "From Russia With Love", sung by Lana Lane and used as the soundtrack to a video montage of the group's visit to Russia. As with Norlander's previous DVD effort, the "Lana Lane 10th Anniversary Concert", the "Live in St. Petersburg" DVD is expertly mixed in Dolby Stereo and also in DTS 5.1 Surround to capture all the subtle nuances of the concert experience. The bonus audio CD is packed with 78 minutes of music, the best performances from the St. Petersburg concert plus the studio tracks of "From Russia With Love" and a new version of "Fanfare for Absent Friends" which first appeared on Norlander's 2004 electronic effort, "Seas of Orion". Both tracks feature Ernst Van Ee on drums and Don Schiff on NS/Stick and were recorded especially for this release. For fans of Erik Norlander, Lana Lane, Rocket Scientists and progressive music in general, "Erik Norlander and Friends - Live in St. Petersburg" is a must - see concert DVD event. Don't miss it! Photos by Jevgeni Babkin and Vladimir Safronov -- thank you!!! ... along with extensive interviews with Erik Norlander, Lana Lane, Kelly Keeling, Peer Verschuren and Ernst Van Ee. About the Bonus Audio CD: Due to the 80-minute time limit of the CD medium, we had to cut some of the songs from the St. Petersburg concert from the audio CD. We chose to omit "Oblivion Days" and "Secrets of Astrology" since there are other live versions of these songs available on previous releases (Erik Norlander - Stars Rain Down, Lana Lane - Return to Japan, respectively). We also did not include the "Live in Hamburg" versions of "Sky Full of Stars " and "Mariner" since another version of each of these songs appears in the St. Petersburg concert. However ... you can download all four of the omitted tracks for FREE on ReverbNation just by signing up for our email list. In return, you will be lightly pestered with our aperiodical email newsletter, The Passing Parade, which is published a few times per year. This release is a document of our 2004 tour, the longest we have undertaken to date. While last year's release of the Lana Lane 10th Anniversary Concert commemorated the final show of that important milestone tour, so does this one chronicle our travels and performances of the year before, 2004. I can say without a doubt that this 2004 tour, which began in California and moved progressively east over 3 months to culminate in the Russian city of St. Petersburg, laid the foundation for the following year's tour in 2005 that ended even further east in the Japanese city of Tokyo. So it is not surprising that now in 2006 we find ourselves back where we started in California. Around the world and back again! What is particularly special about this 2004 tour and the final landmark concert in St. Petersburg is the integration of Kelly Keeling into the band. Kelly had toured with Lana and me the year prior in 2003 (as documented on my previous live CD release, Stars Rain Down), but it was this following year, 2004, that really cemented him into the gallery of Erik Norlander and Lana Lane music. Immediately following this tour, Lana and I recorded her Lady Macbeth CD, and Kelly of course was brought in to contribute to that as well -- those familiar with this excellent album will surely notice Kelly's standout harmony vocals. In 2003 Kelly transformed my old Rocket Scientists song, "Mariner", into a modern day classic with his soulful vocal reinterpretation. So to expand on that for 2004, we added the slightly older classic, "A Salty Dog", from one of my favorite bands, Procol Harum, into our set to follow "Mariner". This pairing was preceded by the similarly nautical instrumental, "Dreamcurrents", completing the trilogy and appropriately presented here from the seaside metropolis of St. Petersburg. As described in the video documentary, "The Road to Russia", the 2004 tour began at the inaugural Cal Prog festival in Southern California on July 3 of that year. I was asked to play a solo set there as I had done at ProgWest, Alfa Centauri and other events in previous years, and I thought it would add so much dimension to the show to have three of my favorite vocalists join me -- Mark McCrite, Kelly Keeling and Lana Lane. I am happy to include here our version of "In the Court of the Crimson King" starring Lana and featuring these other two excellent singers. Following Cal Prog, the band expanded to add drummer extraordinaire Vinny Appice for additional US dates as "The Erik Norlander Trio". Kelly took on the bass guitar job while continuing to sing, and we added some more songs to set with this configuration. By the end of August, we had completed the US dates and were preparing to travel to Europe as "Lana Lane and Erik Norlander" to promote our two live releases, my Stars Rain Down and Lana's Return to Japan, as well as my then - new electronic studio CD, Seas of Orion, which was debuted at the 2004 Alfa Centauri Electronic Music Festival, my second visit to this great event in The Netherlands. For the European leg of the tour, we added our European collaborators, Peer Verschuren (guitar) and Ernst Van Ee (drums), who had toured with us in 2003. These two virtuoso musicians brought their top - notch talents to our music again, and like Kelly, immediately following this tour they also joined us in the recording of the Lana Lane - Lady Macbeth CD. I mentioned the Seas of Orion album and the Alfa Centauri Electronic Music festival. The piece I selected to play from this album at the festival was "Fanfare for Absent Friends", written in honor of the victims of the September 11, 2001 tragedy as the Alfa Centauri concert was to be held exactly three years later to the date on September 11, 2004. At Alfa Centauri, I played the principle synthesizer tracks live along with sequenced backing tracks and drum loops from the album. It was a solo appearance, after all, and an electronic music event to boot. I continued to play the song in this solo configuration throughout the rest of the tour and finally at the St. Petersburg concert in Russia. One man and his backing tracks! Synthesizer karaoke? Perhaps a bit of that. But specially for this release, I asked Ernst Van Ee to record live drums via correspondence for a new version of the song which he did along with engineer Henry McIlveen at Sound Park Studio in Schiedam, NL, where we had recorded the Lady Macbeth album the year before. ("Via correspondence" meaning that I wasn't there. Ernst was there, though, apparently.) Don Schiff added live bass to the song back in California, and I combined their tracks with the live keyboard tracks from the St. Petersburg concert. So this new "studio" version of "Fanfare for Absent Friends" is technically 2/3 studio, 1/3 live. You can some of my live bits intermixed with the concert's end credits. Speaking of studio recordings, Lana and I also thought it would be extremely appropriate to record a cover of the James Bond theme, "From Russia With Love". Lana is a huge fan of James Bond movies, and with such a beautifully melodic and suitably titled song available, we couldn't resist. Ernst recorded drums on this one as well in Schiedam, and then we finished the track back in California -- both northern and southern, actually, as we recorded Lana's brother Greg on accordion in northern California before completing the song with Don Schiff's NS/Stick in Los Angeles. I played Hammond organ and Mellotron strings on the song, and I also went out on a limb and played the guitar parts as well; It was one of those situations where I knew exactly what I wanted to hear, so I just climbed in front of the mic and did it! Like the Lana Lane 10th Anniversary Concert DVD, this package includes a bonus audio CD. I of course couldn't fit everything from the concert onto the one disc, but I did include some highlights -- particularly songs that don't appear on other live releases such as "Dreamcurrents", "Fallen", "A Salty Dog" and Lana's "Guardian Angel" along with a full - band version of "Alexandria" (in contrast to the keyboard and vocal version that appears on the Return to Japan CD). I of course also included the two studio tracks, "Fanfare for Absent Friends" and "From Russia With Love". ...this DVD is not only a treat for your ears and eyes, but with the value for your money, also a treat for your wallet. Erik Norlander is a top notch composer, musician, producer and editor. The DVD Erik Norlander & Friends &endash; Live in St. Petersburg, will show you how symphonic, progressive and melodic rock should sound. There's been no shortage of quality DVD's coming out of the Erik Norlander & Lana Lane camp the last couple of years, and with all the material that these two have recorded in their careers, as well as the many tours of the world they have completed, each video release seems to feature different set lists, making for exciting viewing each time. Live in St. Petersburg is no exception........Overall, the audio and video elements throughout are top-notch, something which one comes to expect with any product from Erik Norlander. So what are you waiting for? To put it in one word Erik Norlander is amazing!!!! He is by far one of the best if not the best keyboard player I have ever heard!...I have always stated that progressive music is for the musician, and this DVD is no exception! ...there is some lyrically charged material...The concert itself is an intimate affair....The band sounds great in both stereo and 5.1 sound. Erik Norlander has a reputation as a killer keyboard player. Live in St. Petersburg, his newest release (and first ever DVD release) offers a plethora of evidence to support this reputation....Erik Norlander's Live in St. Petersburg is a worthy addition to his lengthy curriculum vitae, and an excellent addition to any prog fan's DVD library. I also find Erik Norlander's lilting Californian accent strangely hypnotic as he gently leads us through the story of the 2004 tour. Not only is he a master keyboardist, he is also one of the most eloquent members of the rock music playing fraternity: both verbally, and in his notes from the producer's desk.......I can heartily recommend this DVD complete with bonus audio CD package to fans of Erik Norlander & Lana Lane and indeed to anyone with a liking for quality symphonic rock music performed with panache, conviction and fun. For the conclusion of the European Tour in the year 2004 Erik Norlander and his band was offered the opportunity in the Russian St. Petersburg to arise........the concert shows the unusually high musical standards of an Erik Norlander concert very well. .....All the tracks are ever so wonderful. Erik is a true Synth and Keyboard Wizard. He can easily be placed together with John Lord and Rick Wakeman....don't hesitate buy this great DVD and let Erik and his friends take you on a Fantastic Voyage. ...Obviously the spotlight is on the lavish compositions that features Norlander's skill on keyboards as well as his brilliant programming ability.....Mixed in Dolby Stereo and in DTS 5.1 Surround the sonic tapestry is magnificently represented and compliments the video performances of the entire group of musicians. The Live in St. Petersburg DVD is expertly mixed in Dolby Stereo and also in DTS 5.1 Surround to capture all the subtle nuances of the concert experience. The release is well produced and the concert footage is excellently filmed, shooting the band at its best with multi camera angles. ...Peer Verschuren was also contributor to Norlander's Rock opera "Music Machine" and it's no wonder that many tracks of this masterpiece have found their way into this concert footage.Besides the beautiful "Sky Full Of Stars", the rocker "Beware The Vampires", the ballad "Fallen" and the melodic "One of The Machines", there are also many covers on this release. For example the re-interpreting cover of Procol Harum's classic "A Salty Dog" as following the song of Norlander's "Mariner" from Erik's Rocket Scientists which Keeling also takes to new heights with his soaring vocals and fluid fretless bass.